Behnamghader, A., Bagheri, N., Raissi, B., Marzbanrad, E., Forati, T., Ntentopoulou, D. (2008). Electrophoretic Deposition of Hydroxyapatite. Iranian Journal of Pharmaceutical Sciences, 4(1), 63-68. Aliasghar Behnamghader; Narjes Bagheri; Babak Raissi; Ehsan Marzbanrad; Tahmineh Forati; Dionysia Ntentopoulou. "Electrophoretic Deposition of Hydroxyapatite". 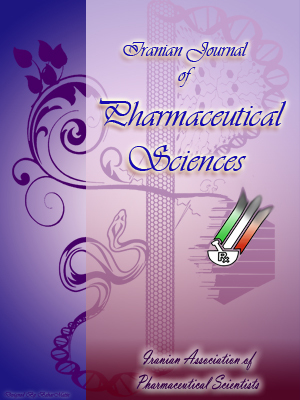 Iranian Journal of Pharmaceutical Sciences, 4, 1, 2008, 63-68. Behnamghader, A., Bagheri, N., Raissi, B., Marzbanrad, E., Forati, T., Ntentopoulou, D. (2008). 'Electrophoretic Deposition of Hydroxyapatite', Iranian Journal of Pharmaceutical Sciences, 4(1), pp. 63-68. Behnamghader, A., Bagheri, N., Raissi, B., Marzbanrad, E., Forati, T., Ntentopoulou, D. Electrophoretic Deposition of Hydroxyapatite. Iranian Journal of Pharmaceutical Sciences, 2008; 4(1): 63-68. The purpose of this study was to investigate the deposition of the hydroxyapatite (HA) coating via the electrophoresis procedure. The HA deposition was performed in an ethanol, methanol, acetone and isopropanol suspension. Methanol was found to be the best deposition media. Among the different environmental conditions, including the encapsulation of the samples under two vacuum types of pressure (10-5-10-4 and 2×10 -2 Torr) and also the purge of the argon gas in the tube-like furnace, the optimum environment was the one demonstrating the encapsulation under the vacuum pressure of 2×10-2 Torr (washing with argon gas of 99.9% purity). After the examination of 3 sintering temperatures (1020, 1050 and 1100 ºC), the sintering temperature at 1050 ºC illustrated the most desired results. The samples sintered under these conditions were apparently intact, most of the interfacial part of the coating was found to be attached to the substrate surface irregularities and no single cracks were observed. The characteristics of the bone tissue, related to its strength and its viscoelastic behavior, are attributed to the presence of the nanometric crystallites, rich in phosphorus and calcium. Hydroxyapatite (HA), the most important member of the calcium phosphates family, demonstrates a good biocompatibility behavior and encourages the bone formation. These advantageous characteristics lead to the worldwide use of this type of biomaterials for hard tissue applications . The HA coatings are coated on metallic substrates by different methods such as plasma spraying process, electrophoresis deposition (EPD), sol-gel process and others. The commercial method for the preparation of these coatings is the plasma spraying process, being inexpensive and highly rapid in the production. However, the employment of this method unfortunately presents some drawbacks. For instance, the preparation of uniform coatings is a hard task, especially for complicated shapes. Another drawback is the presence of various amorphous phases and residual stresses in the product, due to the high cooling speed and the high temperature of the process [2-4]. The suitability for the preparation of the complicated shapes, the ability of the thickness control and the low potentially residual stressing are some of the most significant characteristics of the EPD method . The purpose of this study is to investigate the optimum conditions of the media for the electrophoresis deposition of hydroxyapatite and the sintering of the coated materials. In the following sections, after the description of the used experimental equipment and materials, the obtained results will be discussed. The deposition set-up consisted of the power supply, the amperometer, the voltameters and a timer. The cathode was a Ti-6Al-4V alloy (GOST BT6, Russia) with a thickness of 3 mm, a width of 10 mm and a length of 25 mm. Of this length, only 10 mm were used for the deposition. The glass plate anode was coated with gold on both sides and was placed against the cathode. The deposition was performed at a 100 ml beaker and the voltage was set at the value of 100 V.
Because of the high sensitivity and accuracy of the electrophoretic deposition process, the components used in this process were washed completely. In detail, this equipment was firstly washed with tap water, then with distilled water and, finally, with pure acetone. The surface roughness parameter (Ra) was measured by the mechanical contact method (Surface Roughness Tester-TR100). The micro-structural analysis of the samples was made by scanning electron microscopy (SEM, Cambridge Stereoscan 360). For the micro-structural analysis of the coatings, after the surface preparation, a gold-palladium layer was coated on the samples. The phase analysis was carried out by an X-ray diffractometer (Siemens D-500). The measurement of the calcium-phosphorous ratio was conducted with the Inductively Coupled Plasma method (ICP, ARL 340, Switzerland). Figure 1. The particle size distribution of Hydroxyapatite. The XRD analysis showed the powder used in this work (Merck code, 2196) composed of a crystalline HA. The calcium-phosphorous ratio was 1.66. It should be noted that the accuracy of the ICP technique for the major elements measurement is low . The analysis of the particle size distribution (Figure 1) and its observation by SEM (Figure 2) revealed that the powder demonstrated the particle size distribution ranging from submicrometer to several micrometers. Figure 2. The SEM image of the Hydroxyapatite particles. Table 1. The environment characteristics and the conditions for the sample in the sintering. In order to analyze the effect of the suspension media, to which only a limited number studies have been reported [7-11], the HA deposition was performed in an ethanol, methanol, acetone and isopropanol media. The primary ratio of the HA suspension was fixed 0.6 (Wt%) and the substrate roughness (Ra) value was 2-4 microns. The deposition in isopropanol was too slow and there was no considerable deposition yield. The creation of the electrophoretic layer in acetone was more significant but during the sample extraction from the suspension, a lot of particles were dispersed again in the suspension. This phenomenon could be attributed to the acetone evaporation. The ethanol suspension was better than the two previous suspensions, due to the HA layer creation, even if they were thin and obviously inhomogeneous. However, the best deposited samples, obtained in methanol suspension, were intact and uniform and there was a small dispersion in the suspension while extracting the sample. At first, the deposition speed in methanol was high, but when the time elapsed, there was a speed decrease (Figure 3). The concentration decrease of the suspension and the voltage drop due to the thickening of the layer, have been known as the two influential factors on this phenomenon . Although in the beginning of the deposition all suspensions were opaque, afterwards the transparency gradually increased. After the initiation of the deposition in methanol, it took less than 1 min. for the suspension to become transparent until the completion of the process. This observation is in agreement with the mathematical predictions of the elec-trophoretic deposition. According to the mathematical prediction, at first the relation between the weight of the deposited material and the deposition time should be linear, while afterwards this relation becomes exponential . Sintering is the final preparation stage for the coated ceramic materials. An undesirable sintering can lead to the substrate deformation, the coating cracking or even the substrate/coating separation. Taking into account the available data [3, 8, 10], the following procedure was followed to investigate the appropriate sintering conditions. Because of the sensitivity of titanium surface to oxidation at high temperature, sintering in an environment in the presence of air would destroy the interface between the substrate and the coating. To overcome this problem, sintering was carried out under 3 various conditions; purge of the argon gas into a tube-like furnace and the encapsulation of the samples under two different vacuum environments (Table 1). The temperature and time for sintering were fixed at 1050 ºC and for 1 h, respectively. The thickness of the raw coating in all samples was 60±15 μm. The coating was not absolutely attached to the substrate in the samples, sintered under the argon purge and the use of the tube-like furnace (Figure 4). This phenomenon was related to the destructive influence of the available oxygen, even when the argon gas had been previously purified. The capsule samples were made of quartz tubes with a length of 200 mm and a diameter of 18 mm. The capsule tube was washed twice with argon gas of 99.9% purity. To purify the argon gas from the oxygen impurity, a capsule of red copper powder was used. The samples sintered under the vacuum pressure of 10-5-10-4 and 10-2 Torr were apparently intact. The microscopic observations of the coating/substrate interface exhibited that most of the coating interfacial part was attached to the substrate surface irregularities and no single cracks were noticed (Figures 5 and 6). The crack growth at the substrate/coating interface has been known as a major cause of the interfacial fracture of the coated materials . Two substrates were encapsulated at the same conditions to compare the oxygen effect which might be present in the two used capsule. Despite of the substrate sintered at 10-5-10 -4 Torr, very thin layers of large titanium oxide crystals were observed visually and identified by XRD on the one sintered at 10-2 Torr. Apart from the hydroxyapatite as the major phase component of the coating, various compounds such as CaHPO4, Ca(OH)2 and Ca(H2PO4)2 were also recognized (Figure7). Among the calcium phosphate components, HA is the most stable phase and exhibits the lowest dissolution degree in the simulation body fluid. Dicalcium phosphate (DCP, CaHPO4), monocalcium phosphate [MCP, Ca(H2PO4)2] and monocalcium phosphate monohydrate [MCPM, Ca(H2PO4)2.H2O], due to their characteristics, present many applications as precursors in the synthesis of calcium phosphate powders and/or in bone cement applications . Except for HA, other identified phases can also be the outcome of sintering at vacuum environment and, subsequently, a different effect will be noticed on the substrate at the interfacial part of the coating. These parameters lead to the phosphorous diffusion from the coating to the substrate, the crystalline allotropic transformation, the crystalline transformation to an amorphous component and the change of the phase trans-formations temperature [8, 9, 12-15]. The examination of the coating chemical analysis revealed that the phosphorous amount in the outer surface of the coating was smaller compared with that in the interfacial part of the coating. Taking into account the corresponding results attained from sintering under the vacuum pressure of 10-5-10-4 and 10-2 Torr and considering the cost and the feasibility aspects for the preparation of an environment type with high vacuum, the vacuum pressure of 10-2 Torr would be preferred. Figure 3. The deposition thickness variation during the elec-trophoretic deposition. Figure 4. Detachment of the coating from the substrate in the samples sintered in tube-like furnace (optical microscope). Figure 5. The SEM image of the cross section surface of the encapsulated sample sintered under the vacuum pressure of 2×10-2 Torr and at 1050 ºC. Samples were sintered at the temperatures of 1020, 1050 and 1100 ºC for 1h, to investigate the effect of the sintering temperature. The sample sintered at 1100 ºC was deformed slightly. As depicted in Figure 8, the microstructural discontinuity and the defects in the samples sintered at 1020 ºC were greater than the ones sintered at 1050 ºC. Figure 8. The outer surface of the encapsulated coating sintered under the vacuum pressure of 2×10-2 Torr and at 1020 ºC (optical microscopy). Based on the results obtained in this research, the methanol proved to be the most suitable media for the electrophoretic deposition of hydroxyapatite with respect to ethanol, acetone and isopropanol media. The best sintering condition was concluded to be the encapsulation under the vacuum pressure of 2×10-2 Torr (washing with argon gas of 99.9% purity) with the sintering temperature of 1050 ºC. The samples, sintered under these conditions, were clearly intact, the coating was attached to the substrate and no gap was observed at the coating/substrate interface. This research is a part of the internal Project, supported by the Material and Energy Research Center. The authors are grateful for the co-operation of this Center, particularly the Thermal Processing, Vacuum preparation and materials characterization laboratories. LeGeros RZ, LeGeros JP. An introduction to bioceramics, Dense hydroxyapatite. In: Hench LL, Wilson J, (editor). Advanced Series in Ceramics. Boca Raton: World Scientific, 1993; pp. 139-80. Tsui YC, Doyle C, Clyne TW. Plasma sprayed hydroxyapatite coatings on titanium substrates. Part 2: Optimization of coating properties. Biomaterials 1998; 19: 2031-43.
prostheses. PhD Thesis, ENSAM, France, 1999. Khor KA, Cheang P, Wang Y. The thermal spray processing of HA powders and coatings. J Met 1997; 49: 51-7. Sarkar P, Nicholson PS. Electrophoretic deposition (EPD): Mechanisms, kinetics, and application to ceramics. J Am Ceram Soc 1996; 79: 1987-2002. Faires LM. Inductively coupled plasma-atomic emission spectroscopy. In: Ruth E, (Coordinator) ASM Handbook Committee. Materials Charac-terization. New Yourk: ASM International Publishing Co. 1992; 10: 31-42. Zhitomirsky I. Cathodic electrodeposition of ceramic and organoceramic materials-Fundamental aspects. Adv Colloid Interfac 2002; 97: 279-317. Zhitomirsky I, Gal-Or L. Electrophoretic deposition of hydroxyapatite. J Mater Sci Mate M 1997; 8: 213-9. Ducheyne P, Radin S. Calcium phospate ceramic coatings on porous titanium: effect of structure and composition on electrophoretic deposition, vacuum sintering and in vitro dissolution. Biomaterials 1990; 11: 244-54. Stoch A, Brozek A, Kmita G, Stoch J, Jastrzebski W, Rakowska A. Electrophoretic coating of hydroxyapatite on titanium implants. J Mol Struct 2001; 596: 191-200. Agata de sena L, Calixto de Andrade M, Rossi AM, Gloria de Almeida S. Hydroxyapatite deposition by electrophoresis on titanium sheets with different surface finishing. J Biomed Mater Res 2002; 60: 1-7. Bohner M. Calcium orthophosphates in medicine: From ceramics to calcium phosphate cements. Injury 2000; 31: 37-47. Wei M. Electrophoretic deposition of hydroxyapatite coatings on metal substrates: A nanoparticulate dual-coating approach. J Sol-Gel Sci Technol 2001; 21: 39-48. Wang PE, Chaki TK. Sintering behaviour and mechanical properties of hydroxyapatite and dicalcium phosphate. J Mater Sci Mate M 1993; 4: 150-8. Weng J. Thermal decomposition of hydroxyapatite structure induced by titanium and its dioxide. J Mater Sci Lett 1994; 13: 159-61.